Semantic Compliance® uses Web 3.0 architecture, methods, and technology to deliver regulatory reporting for financial institutions. Conventional compliance architecture suffers from a myriad of components for requirements and data management, ETL and rules processing. The problem is that each component has its own way to representing and storing the metadata. As a result we need numerous mappings and transformations to obtain a holistic picture of the data item, its regulatory requirement and data source. The Semantic Web is part of a third generation Web 3.0., where information is stored in a way that computers as well as humans can understand. The World Wide Web Consortium (W3C) has released standards for common data formats and exchange protocols, in particular the Resource Description Framework (RDF). In RDF information about resources is stored as a simple triples of subject-predicate-object. Ontology Web Language (OWL) standard extends RDF with semantics for classes, properties and individuals. While there are still many components in a semantic compliance architecture, the difference to conventional approaches is that all components store their information with RDF/OWL within the ontology. Data, model, transformations, business rules, requirements, mapping and lineage – everything is a triple. Bio and Medical domain have mastered complexity using Semantic Web technologies. The GENE ontology is a prominent example. Research, clinical and increasingly medical information is stored and exchanged in RDF/OWL. Regulatory compliance crosses the domains if Finance and Legal. The Financial Industry Business Ontology (FIBO) is a collaboration between the Enterprise Data Management Council and the Object Management Group. FIBO holds the financial information and reference data. The Legal Knowledge Interchange Format (LKIF), a European Union project models legal rules of the kind found in legislation and regulations. LKIF holds the legislative context, text of laws and regulations and legal forms. 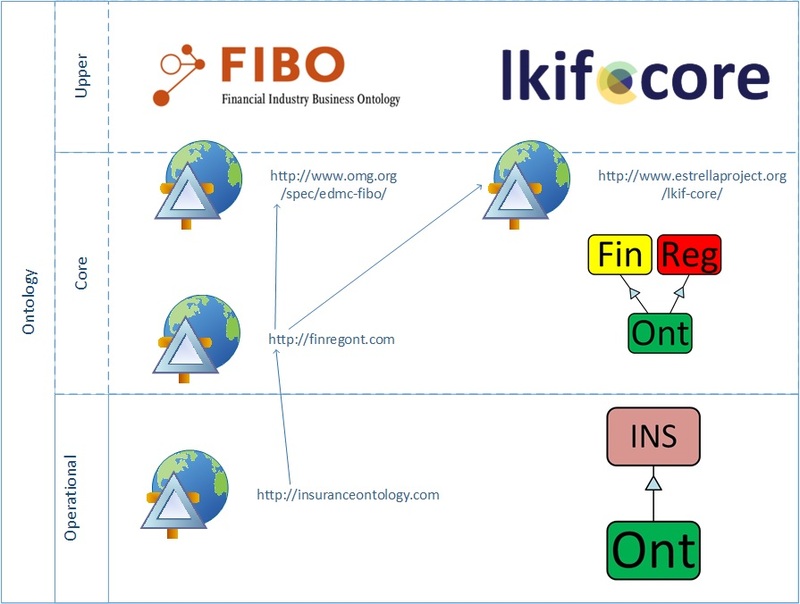 The Insurance Regulation Ontology (IRO) is an operational implementation of the Financial Regulation Ontology (FRO). That means IRO includes FRO and thus LKIF and FIBO and extends the ontologies with insurance specific concepts. FRO aligns the two reference ontologies. Ontology alignment means that for each required entity (concept, relation, and instance) in LKIF we identify a corresponding entity in FIBO. For Example, the FIBO Regulatory Agency is equivalent to FRO’s LKIF extension of Regulatory Authority. The Financial Regulation set of ontology modules started out as an operational ontology for Hedge Fund compliance. We had a need to directly tie encoded rules to their requirement specified for Investment Companies & Advisers in the Code of Federal Regulations (CFR) and United States Code (USC) paragraphs. The CF/USC class structure is generic for all laws and regulations. So we extracted Financial Regulation Ontology for reuse in all Financial Industry. The operational ontologies for investment management have RDF/OWL version of forms ADV (advisers) and PF (private funds), banking has form FFIEC, the Call Report. The Insurance Ontology is still in development. See an ontology for parts of Solvency II here. Latest update: The FIBO still doesn’t have insurance specific content. However, the Financial Industry Business Data Model (FIB-DM) Core is Open Source and contains a foundation for the sub-domain.